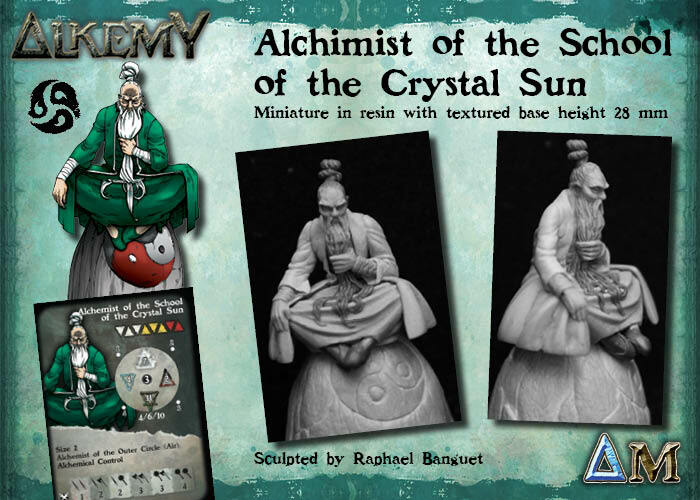 Other than minor alchemists that only have one formula and 2 AP, the Alchemist of the School of the Crystal Sun in the cheapest alchemist in the game. But he is in no way as good as his other counterparts. He has a similar profile to his direct equivalent, the Alchemist of the School of the Long Breath, with only 8 HP, DEF 11, REF 4. He has MIND 7, but because both his formulas are automatic, this is not a penalty. His first formula is cheap (1 component) and can have a very substantial impact in the early game. It makes it possible to give the Stealthy skill to allies within range. This powerful skill allows allies to move forward quickly on objectives without fear of receiving a Charge or having cover against shooting. This is an area of effect around the alchemist. He will therefore have to move to ensure the advance of his allies. His second formula is much more offensive because it increases damage dealt by allies within range of the formula, consuming an alchemical stone to increase DAMAGE up to the limit of his concentration level. This formula has the advantage of lasting as long as the alchemist is focused, which he can easily keep with his special ability: Alchemical Control. On paper, this formula is extremely powerful. It can be used to nibble the opponent increasing Allied attacks by 1 or 2 DAM or used to suddenly inflict enormous damage. If concentration is at level 4, it can increase damage by 4. With the fast attacks of Shadows (up to 9 DAM! ), or the shooting of Whispers and Militia Archers (shooting damage table 6/6/7/7/8/8 and 5/6/6/7/7/7 respectively), the effect will be devastating, but depends on the number of stones. When the alchemist is out of stones, the formula becomes useless. With 10 stones, the alchemist inflicts a maximum of 10 Damage thanks to this formula. List 1: Fu Nihao Captain of the Triadic Army, Alchemist of the School of the Crystal Sun, 3 Triadic Guard, 1 Sergeant of Triadic Guard, 1 Cobra Guard Shadow. In this rather defensive list, the alchemist has a dual function. It must first protect the advance of the triadic guards, which have a low defense, to enable them to quickly accomplish objectives. It will also serve to boost the DAM of the guards and especially the Cobra Guard Shadow once the battles begin. We must therefore use the alchemical stones sparingly to make the most of the two formulas. This list works on the interaction between Feng Sao and shooters, supported by the Alchemist of the School of the Crystal Sun. The Whisper and the archer can greatly weaken the enemy miniatures through the bonus of the alchemist’s second formula that will be finished by Feng Sao’s sharp tornado. The best part is that it also works the other way. Other miniatures are mainly there to take objectives.